My copy of The Houses – Temples of the Sky arrived last week from Wessex Astrologer, and because it is a relatively slim book, I expected to have read it in preparation for this review in a matter of a few days. However, it is a testament to the sheer amount of information contained therein when I confess that it took the whole week to really do this book justice. The book was written by Deborah Houlding, who was interviewed on this blog a few weeks ago. In the interview, Houlding spoke of practicing traditional astrology, and in The Houses, we get a glimpse into Houlding’s sources. The Houses – Temples of the Sky is highly recommended, especially for intermediate and advanced students of astrology. However, beginners could also benefit greatly from this book, provided they are prepared to do a little more intensive studying than other books on houses require. It is also useful as a quick reference comparing what ancient astrologer XYZ said in contrast with astrologer ABC, without having to find the relevant material in each book. Both modern and traditional astrologers will find much substantial information here. This is the nec plus ultra of books on houses. Three introductory chapters begin the book. The first is a foreword by Robert Hand, followed by two chapters on the theory and practice of house division. Here, the author objects to the simplification of house = sign = planet, which is a recent melding together of largely unrelated concepts. We are then whisked through some of the basic terminology of house division, though I suspect that most readers of an intermediate-level book such will be familiar with these concepts. The text itself then starts with a historical summary of the way houses were used in ancient astrology, followed by a very interesting and rarely seen analysis of the ancient astrologers’ use of the four angles of the horoscope. Houlding links the fourth house to the ancient Egyptian concept of the underworld as the source whence we emerge and to which we eventually return. As a result, traditional astrology sees the fourth house of all things contained within the earth, including graves; and our biological source, our ancestors. Each angle is analyzed and various historical sources are given for the meaning. The subsequent four chapters address the non-angular house polarities; second/eighth, fifth/11th, third/ninth, and sixth/12th. The opposing houses in the horoscope carry related but different meanings, and Houlding wisely analyzes the houses in pairs, to better compare and contrast the often subtle differences among them. As with the chapter on the angles, multiple sources are given for the meaning of each house, with a summary of each source’s material. Then, from a practicing astrologer’s point of view, we get to the really juicy part. 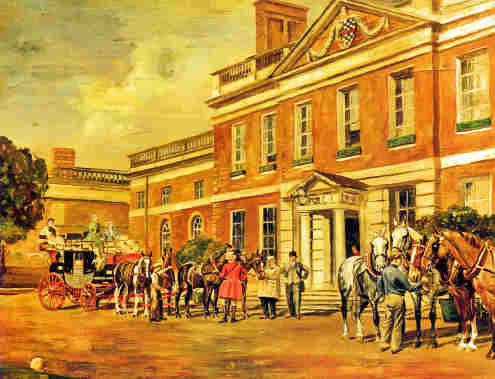 Each house is treated separately in a section called “House Rulerships and Practice.” The house meanings are categorized according to the main rulerships, horary associations, mundane associations, lawsuits/conflicts, events, medical matters, commerce, colors, qualities (angular, diurnal, masculine, etc. ), compass direction, associated planets and signs, and other names of the house. Following the house attributions, we go on to more chapters dealing head-on with the multiple house systems available to astrologers. Houlding describes the problematic nature of dividing space based on the ecliptic, which becomes particularly troublesome in high latitudes. She then describes some alternatives to this method, and the pluses and minuses of the major house division systems. An interesting chapter is devoted to Ptolemy and his lack of use of the houses, as well as his interchangeable use of the words “place” and “sign”. There is some discussion of the concept of angularity, and whether planets near an angle but not within it can be considered truly angular, based on various sources. Finally, we get a very detailed glossary of terms, followed by an explanation of the planetary hours, as well as Al-Biruni’s instructions on finding the hour of birth. There is a convenient house rulerships index, in addition to a general index for the entire book. The Houses is very useful, particularly as a solid reference book. To my knowledge, there are no other books on houses that deal in such depth with traditional house rulerships, as does this one. In particular, the individual house rulerships section will be invaluable to anyone reading a horoscope, whether it is a horary, natal, or mundane chart. Pulling together major sources in one book is no small feat, and clearly a lot of research went into this deceptively slim volume. As a traditional astrologer, I could have done without the modern house attributions intermixed with the traditional sources in the book. The Houses is a book appealing both to traditional and modern astrologers, while blending the two approaches. At times, this was interesting and enlightening, as with the inclusion of Charles Carter’s mundane house meanings, but other times, the approach wasn’t that helpful, resulting in my glossing over modern house attributions to get to the “good stuff.” Some of the modern house attributions are questionable in their validity, and it is no fun sifting through them to get to more accurate material, even if the book is very even-handed as a result! Still, because the approach to the traditional authorities is so thorough, this was a minor price to pay. I particularly appreciated the detailed discussion of the pros and cons of various house division systems. Since most of us are familiar with the house systems primarily from the menu in our astrology software, it is very useful to learn more about the history, origins, and rationale behind each method. The useful section on equal houses should invigorate and inform the ongoing debate between proponents of various house division systems. The value of this book will most certainly last through the years, as good astrological reference books are hard to come by. Ultimately, it is best to go to the original source, but when I want to know what Al-Biruni thought of the 8th house, and how his approach contrasted with William Lilly’s or that of modern astrology, this is the go-to book. Available at astroamerica.com, the Wessex Astrologer, and at Amazon. (If you have written or published an astrology book you would like reviewed on Gryphon Astrology, please contact me at nina [at] gryphonastrology.com or write to me here (don’t forget to include your contact info). Free Astrology Advice: Horary Astrology – Will I Keep My House? How do I get out of my very serious financial situation? I had to pay my ex-husband out for the family home and truly paid more than was fair and I have got into trouble paying it back and borrowed from hither and thither to make it happen to keep a roof over my university sons’ heads and now I am in serious financial difficulty. I don’t want to sell the house but was wondering whether there is any indication of a windfall or some other money coming my way that would help me not have to move and pay out the house. Thanks. My situation is truly dire. I’m sorry to hear about your financial difficulties; I know how these things can somehow snowball out of control very quickly. Let us see whether anything good is coming your way, or whether you should start doing some damage control. Either way, at least you will not be operating in the dark. We can see that your financial situation is difficult indeed. First, we see that Saturn in Leo (where it is in its detriment), retrograde to boot, is sitting right on your ascendant. So something is definitely weighing on you — since Saturn signifies poverty and hardship in general, we can see that this is very much at the forefront of your mind. Also, the malefic South node is closely conjunct your second house cusp of money. Not only that, but Mercury, which rules your money, is combust (probably the worst affliction that can happen to a planet) by being so close to the Sun. You’re figuratively burning your money, just like Mercury is burning due to its proximity to the Sun. Obviously, this isn’t anything you don’t already know, but it just goes to show that this chart very closely reflects your actual situation. However, all is not lost. We see that the moon will shortly trine a very powerful Jupiter and its own sign of Sagittarius. Jupiter is considered the Great Benefic, and it is extremely helpful when it is in its own sign, because that it has more power to help. Jupiter rules the fifth house of profit from real estate. This may mean you will sell the house, or it may simply mean that you can make money from your house in some other way, such as renting part of it out. Either way, you will end up with a good chunk of change because Jupiter is so strong. Mercury, which I already said rules your money, will very shortly sextile the Part of Fortune, another sign that some money is coming your way soon. The thing we need to determine is where this money will be coming from. It may be coming from a significant other or simply “any old person.” Have you considered speaking with your ex-husband about keeping the house to make your sons’ lives easier? It seems that he has something at stake here as well, as they are presumably his children, too. The real underlying question here is whether you will lose your house. There is the possibility that you will sell it, because Mars is going to trine Saturn in 3° (this can be three months or three years, depending on how fast these things move in your part of the world). Saturn is this nasty thing we discussed earlier, or can simply mean a buyer. My suspicion is that you will end up selling the house, but you will make more money from it than you expected, and you may have to downgrade only a little bit. This situation puts me in mind of a traditional way of not getting evicted from a house. You might want to give it a try. Take a bath, though not a soapy one, just one into which you have added some salt and some holy water, if you’re religious. As you bathe, pray for being able to stay in your house. Once you’re done with the bath, save some of the used bathwater and wash your floors with it. Because your situation seems to be so urgent, I would do this bath/floor wash frequently, maybe once a week or more. Let me know how it goes. — Readers who are interested in their own astrological consultation with Nina Gryphon may read more about the details and prices at the Reading Requests page. Free Astrology Advice: Horary Astrology – Will We Sell Our House This Month? We need to sell our home this month. We are building another home out of this state and we are expecting settlement next month. Please tell me if you see us selling soon and if you see us getting the amount we’re asking. First, let’s take a look at the condition of the house relative to the price. 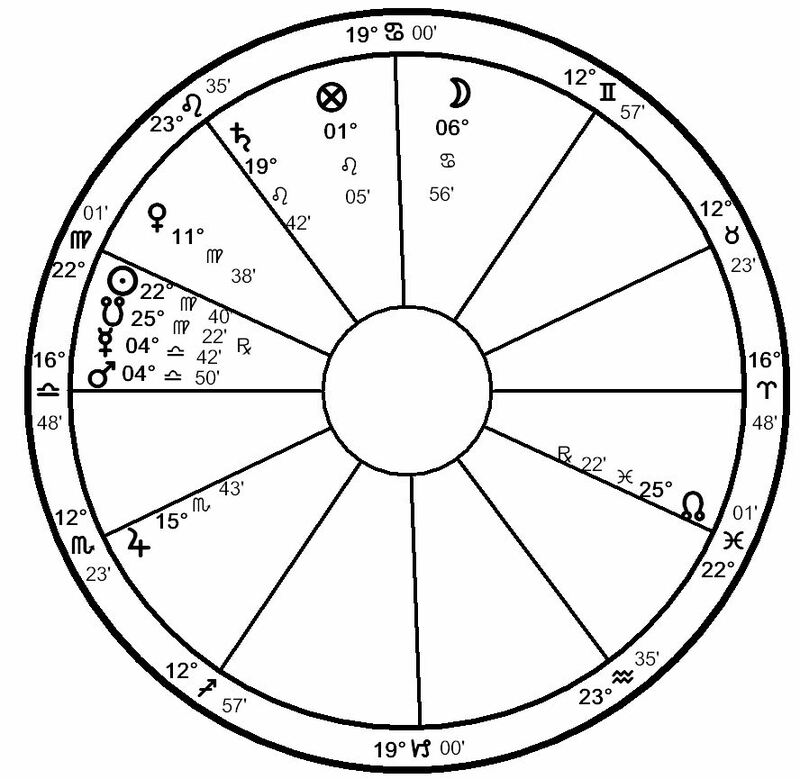 The house itself is shown by the fourth house of the chart, which is ruled by Jupiter in Scorpio in the 12th house. Jupiter is peregrine, showing the condition of the house could be better. However, overall the house is fine; the North node is just inside the fourth cusp, making me think there aren’t significant problems. The price is shown by the opposite house, the 10th. Its ruler is Mercury in Libra, and while it is also peregrine, it just separated from the benefic fixed star Spica. I wonder if you recently lowered the price or simply are asking less than you think you could. In any case, the price (as it currently stands) seems to be reasonably suited to the condition of the house, and I expect you will get what you are asking or very close to it. The thing we want to look for here is whether you will get together with the buyer sooner rather than later. You are shown by Jupiter (so is the house, but that is a separate query), while the potential buyer is shown by Mercury. We do not see an applying aspect between these two planets, but we do see that the Moon, which is your co–significator, will soon trine Saturn. Mercury has recently trined Saturn as well, so we see that there will be a third party, presumably an agent, who will bring seller and buyer together. The Moon will trine Saturn in about 6°. I believe that this refers to six weeks, though ultimately this depends on your local market. So, to briefly answer your question, I am not sure if you will be able to sell within a month, but you should sell shortly thereafter. — Readers who are interested in a private consultation with Nina Gryphon may contact her at nina@gryphonastrology.com. Free Astrology Advice – Horary Astrology: Will We Sell the House and When? Am I ever going to sell my house? It’s been on the market for 4 months and no one is interested (even though we have updates). We are very discouraged! As you or anyone who reads this column at all regularly knows, the US housing market is not doing terribly well these days, especially in areas where it tended to become highly inflated. Either of the coasts fall under this heading, and people everywhere are trying very hard to sell houses that suddenly just will not move. At the end of this column, I will give the very popular instructions for working with St. Joseph to sell your house. I get a lot of e-mails regarding this, and a number of requests for the St. Joseph real estate kits, so I find the information is worthwhile repeating every now and then. You are represented by Venus in Virgo, while the person who will buy your house is shown by Mars in Libra. Venus is quite weak in Virgo, which is the sign of Venus’s fall. What is the reason for Venus’s weakness? Mercury, which rules Venus’s sign. Here, Mercury is the buyer’s money, so Venus is not doing too well because she is dependent on getting the buyer’s money. Mars (the buyer) is also weak in Libra, the sign of its detriment, but for a somewhat different reason. Mars is very interested in Venus, so we can see that there is an interested buyer on the horizon. Also, in Libra, Mars is in the exaltation of Saturn. This means that the buyer overestimates and very highly values whatever Saturn represents. Saturn rules the fourth house of real estate, so we see that the buyer highly values and overestimates the value of the house. If you are the seller, this is excellent news. You mention your house has been on the market four months and has not yet sold. Let us take a look at why that might be. As I said, the house is shown by Saturn in Leo, which is in its detriment. Unless there is something particularly descriptive about Leo which would not make it negative for Saturn, we can assume the house is not fabulous. You mention the house is about 50 years old; in today’s market, where everyone is looking for a brand-new construction, this can indeed be a problem. The 10th house shows the price, which is the Moon in Cancer. In Cancer, the Moon is in its own sign, so it is very strong. So we have a relatively weak house combined with a relatively strong price; one can see why the buyers are not flocking. This is especially a problem if the market has fallen off a cliff as a whole, as you would not attract people who are speculating with real estate. The other thing is that in Cancer, the Moon is in Saturn’s detriment, so the price harms the desirability of the house. However, I would not go and reduce the price drastically just yet. Whoever will buy this house will think it is better than it really is, so presumably they will not mind paying your asking price. The Moon has just separated from a square to Mars, and will sextile Venus in about 4.5 degrees. So we have an astrological phenomenon known as translation of the light, where a fast moving planet picks up one planet and brings it to another. Here, the Moon joins you and the buyer, so the Moon is showing us the agent. So we know the sale will occur 4.5 somethings from the time of the question, which was September 15. With the Moon in the cadent ninth house and in a Cardinal sign, we can assume we are looking at weeks or months. I incline more toward weeks, especially since the buyer seems pretty motivated. So I would expect the sale in the second half of October. One way to do help your house sell faster is to petition Saint Joseph, the traditional saint of real estate. Do you have to be Catholic or religious? Definitely not; Saint Joseph works with anyone, and your results will have more to do with your following the instructions carefully and giftedness for this sort of work than anything else. The traditional way to work with Saint Joseph is to burn a Saint Joseph candle dressed with Saint Joseph oil and with special herbs associated with the saint. Too, you will want to put a Saint Joseph print that has been dressed with the oil among your house papers (like the deed of ownership, etc.). The whole property must be liberally dressed with Saint Joseph oil, and one would bury a Saint Joseph statuette (also dressed with the oil) upside down on the property. Then, you make a prayer for the saint’s assistance. Once the property sells, the statuette must be dug up, cleaned off and put in a place of honor in the new home. This is important, as not giving Saint Joseph proper respect will result in problems involving the old property. I have had a number of people e-mailing me asking me where they can obtain St. Joseph spiritual supplies. I sell a St. Joseph real estate kit, which includes a Saint Joseph blessed candle, St. Joseph oil, a St. Joseph statuette, a chromo print, and a holy card, as well as complete instructions for use. These kits cost $20 plus shipping. You can contact me if interested at nina@gryphonastrology.com. These kits have proved extremely popular, and are momentarily out of stock. However, I am currently taking pre-orders from interested parties, and expect to have the kits back in stock by the middle of October. The kits will be shipped out on a first-come, first-served basis. To inquire about purchasing the Saint Joseph items mentioned for real estate spiritual work, or to inquire about a private astrology reading, contact me at nina@gryphonastrology.com. Since starting my advice column with an astrology question about selling real estate, I have received countless questions about whether people will be able to sell their houses. This is always a concern, unless one is living in a red-hot market, but especially now, after this recent solar eclipse on September 22, when the housing market is expected to head south in the United States. The thing to remember when looking at horoscopes about house sales, whether we are looking at horary or natal charts, is that we always have to look at what is going on with the fourth house. The fourth house rules real estate, the home, and immovable property in general. It doesn’t matter whether you live in the house, or whether it is just an investment property, or a beach house where you spend a week a year. Immovable property is always the fourth house. For clients whose natal charts I analyze in private consultations, fourth house activity in the natal horoscope, as well a second house activity, which shows income, are always reliable indicators of selling real estate. This is similar to the shorter horary astrology charts that I analyze on the blog. I will demonstrate what I mean by looking at the chart of someone very well-known for real estate transactions. 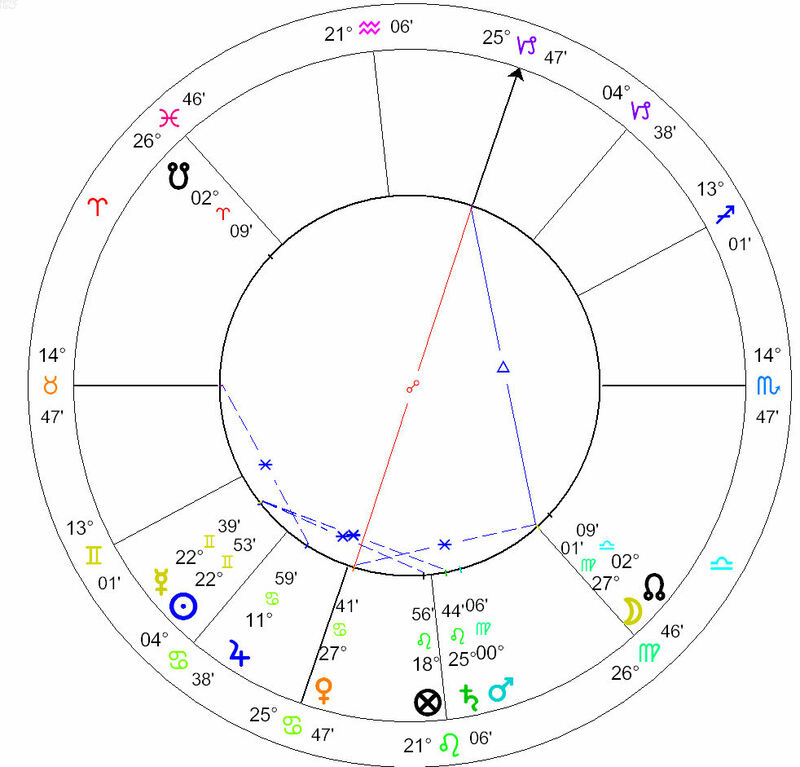 Below is the natal chart of Donald Trump, the American a real estate developer and businessman. By way of background, Trump first proposed to reconstruct the rundown Commodore Hotel in New York City in 1976. His proposal enraged other real estate developers, because Trump was able to start work on the hotel with special tax breaks from the New York City government. In 1978, Trump sold his stake in the Commodore Hotel to Hyatt Hotels, and broke ground on the construction project. Trump’s solar returns for 1978 (both the solar return ending that year, and the solar return beginning that year) show not only an intense focus on fourth house matters, but also the profit that he realized in 1978, before even beginning construction. Thus the above principles are satisfied, and that we see real estate matters affected and finances being affected as well. First, before making any predictions, we need to look at the rulers of the appropriate houses in Trump’s natal chart. As for his finances, they will be ruled by Mercury, which is the ruler both by domicile and by exaltation of the second house of money. Real estate will be ruled by Mars, which rules his fourth house of immovable property. 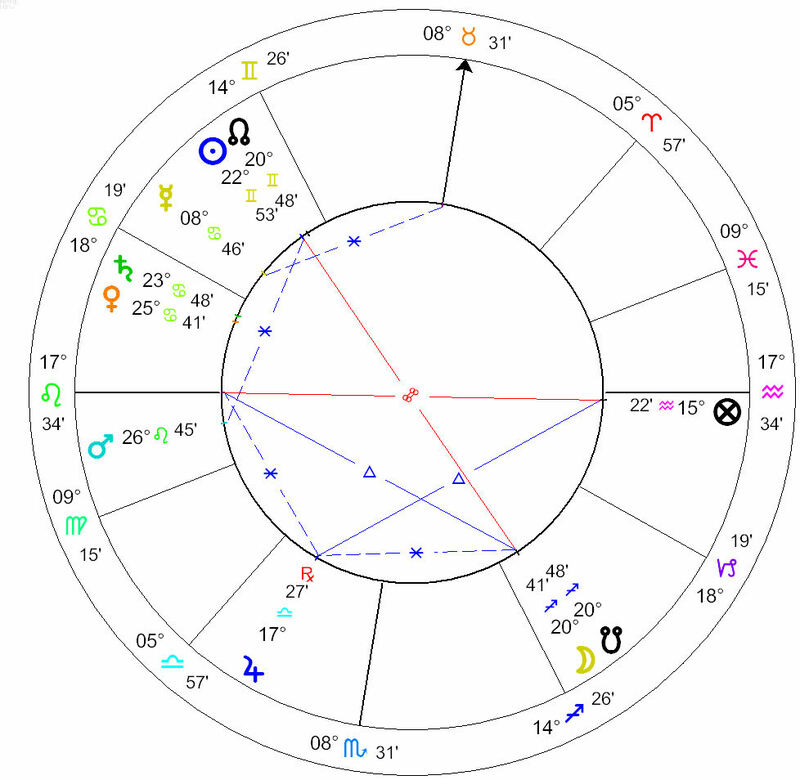 Note that Mars is extremely strong in Trump’s chart; it is the only angular planet, and it is on the royal fixed star Regulus. Therefore, whatever Mars symbolizes will be kinglike and blessed with great success and renown. Regulus, interestingly, also can cause fall from power. 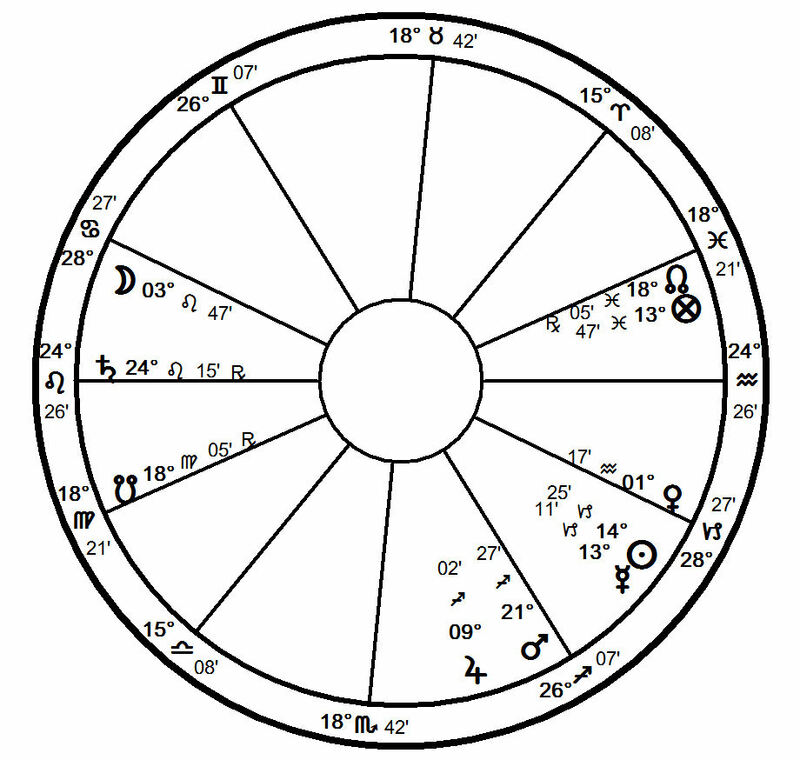 In the first solar return starting in 1977 and ending on Trump’s birthday in 1978, Venus and Mars are conjoined in Taurus in the fourth house. Venus rules Trump’s 10th house of career. Venus is in its own sign, while Mars is in its detriment in Taurus. This is as good a portrait as any of his decision to take on the Commodore Hotel reconstruction. The real estate itself is shown to be very weak, because it is shown by this weak Mars. 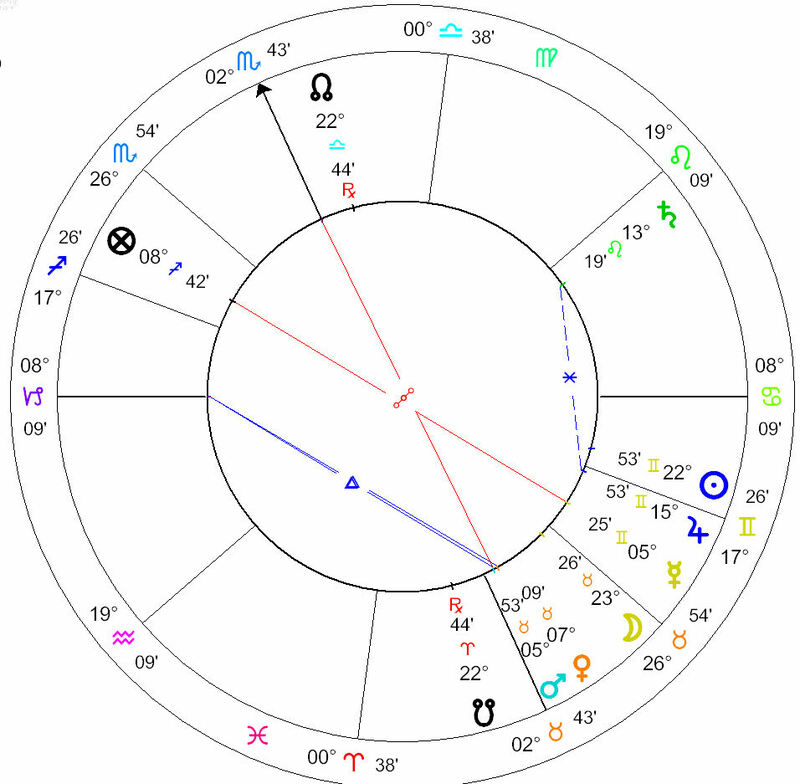 However, Trump’s career, as shown by Venus, is greatly benefiting from running into this bad Mars. The fact that the conjunction trines the solar return ascendant does not hurt, either. It is the following solar return, however, that really fulfills the promise of Trump’s natal chart. In that solar return, we see Venus in Cancer, again, just inside the fourth house cusp. Whenever we see this repeating theme, especially in subsequent solar returns, we sit up and pay attention. In this solar return, Mars has just entered Virgo. Just before entering Virgo, Mars was on Regulus and just before that, Mars was conjoined with Saturn in Leo, showing that Mars was previously been in bad condition, but then rapidly improved, at least in Trump’s vision. We can see that the hotel (for that is what Mars signifies), is now split into multiple parts, since Virgo is a double sign. This indicates Trump’s sale of a stake in the hotel to Hyatt. Mars is in Virgo, which is ruled by Mercury, ruler of Trump’s finances. How is Mercury in the solar return? Mercury is in its own sign in Gemini in cazimi with the Sun. Cazimi means “in the heart of the Sun” and therefore is highly beneficial for Mercury. Mercury and the Sun are both positioned in the second house of wealth. Was this a good year financially for Trump? Yes, definitely. You can see that real estate sales are easy to find in the chart, whether you’re selling your primary residence or a real estate investment property, as Trump did. However, finding it in the chart is of no help if you cannot sell the darn thing, no matter how hard you try. Below are some suggestions for selling real estate. These suggestions are commonly employed by real estate agents in the United States, and possibly elsewhere, though I have no information about this practice in other countries. As many of you may know, I have a biweekly astrology radio show. For those of you who are not yet familiar with it, I encourage you to go to my website and listen to one of the recent episodes. On the show, my delightful co-host, Bernhard Bergbauer (a German astrologer) and I discuss astrology in theory and in practice. We also make a lot of jokes that quite possibly only an astrologer could appreciate. 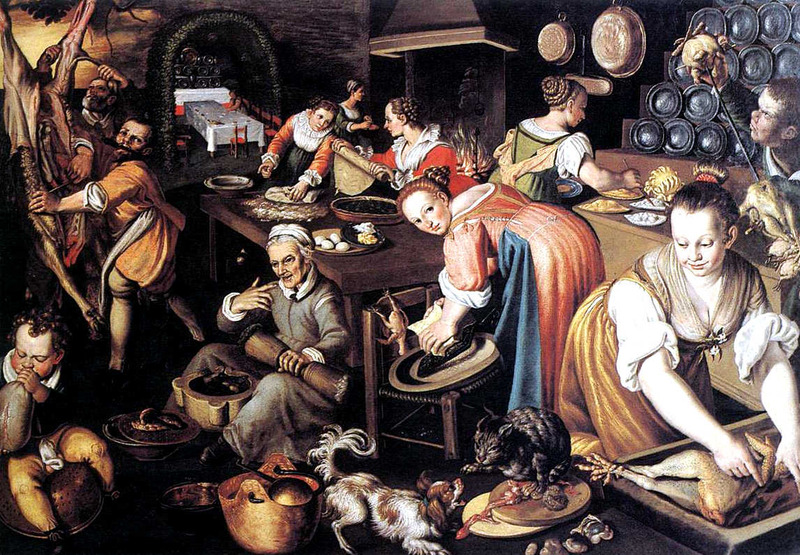 Last Sunday, Bernhard and I discussed the fourth house in the horoscope, which is the house of the family, the father, the home, and “the end of the matter” in horary astrology. Bernhard brought two horary charts on buying a house, while I analyzed the natal charts of two men who were homeless for a long time. Both sets of charts focused on the fourth house issues of home, and possible real estate transactions. You may find the most recent episode of the Gryphon Astrology Radio Show here. The radio show was a great deal of fun, and our theme was the 1st/7th house axis, which is always interesting and super-important to everyone, including our clients. To hear the show and look at the charts that we analyzed, click here. The next show will air on Sunday, August 6th, 2006, and our theme will be the second house. If you have a money-related question (horary or natal) you’d like to submit to the show and hear it analyzed on the air, email me at nina@gryphonastrology.com. I have to confess, the second house is one of my favorites in the whole chart. No foofy talk here about self-actualization and archetypal realization; this is all verifiable, real-world information. The second house tells you immediately the reality of someone’s existence; even if they drive a late-model European sports car, one look at their second house will tell you if there is money in the bank to back that up, or if the Porsche is bought on 1000 easy payments of just $9.95 a month, at 20% interest. I like to think of it as the traditional astrologer’s X-ray vision, if you will. I like the second house so much that I even wrote an article about finding wealth in the chart for the fall ’06 issue of Astrologia Restaurata; if you read German, so much the better. William Lilly, who by all accounts was not totally averse to the second house himself (especially the packed second houses of his spouses), spends a good amount of time on the topic in his Christian Astrology. 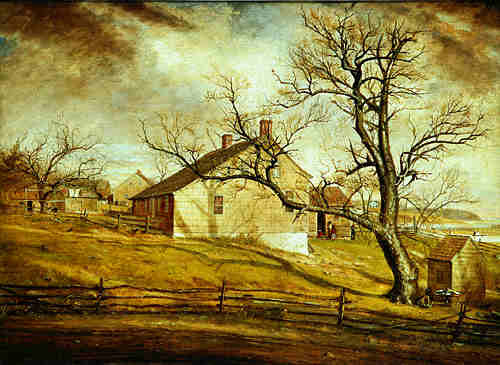 In general, Lilly writes that one must look at the 2nd house and any associated planets either in the house or ruling the house – or both, and then observe what other planets, if any, influence those significators for good or ill.
After some amount of throat clearing, Lilly says that wealth is given when the lights are with eminent fixed stars or the Fortunes. Undoubtedly, this is a very helpful sign. In our article recently about Margaret Thatcher, her Moon is on Regulus, probably THE most eminent fixed star. 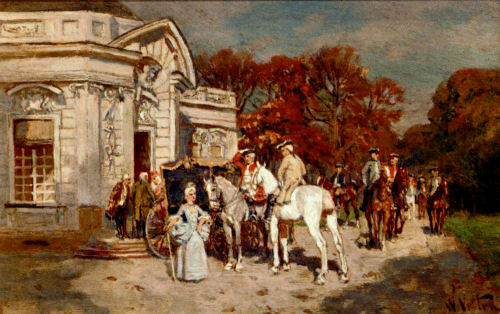 For a grocer’s daughter, she did well; she married one of the nobility, and managed to amass a respectable fortune during her climb to and residence at the top. 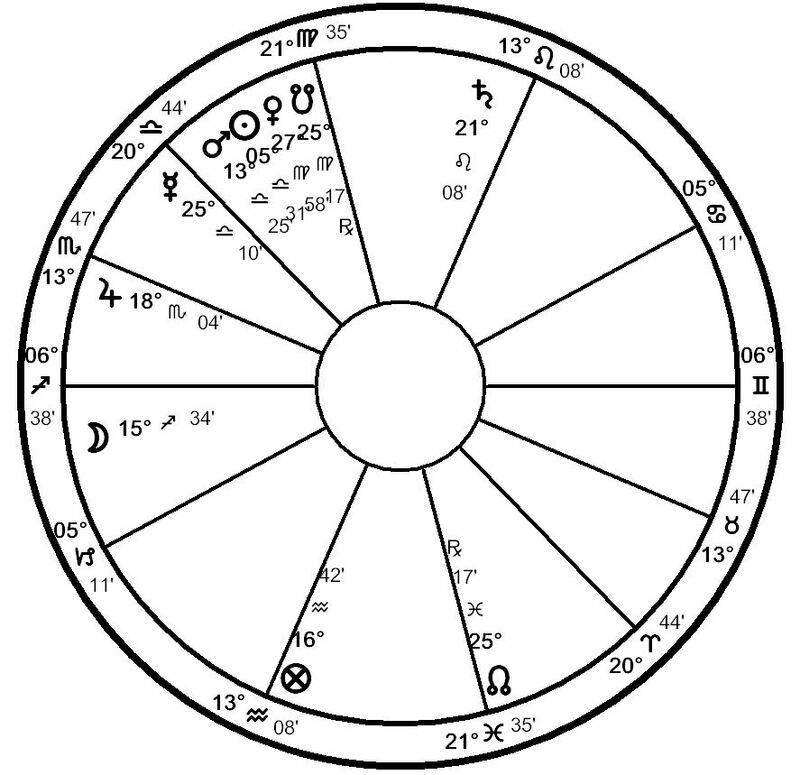 Conversely, Lilly finds that the Moon with Saturn reduces the native to poverty, “though a King.” This is most likely because the Moon is such a powerful force of sheer fertility and generation in the chart; fertility of body, but also of the pocket. With Saturn, the Moon is a shriveled up, dessicated, reduced thing; once a grape, now a raisin. Lilly then goes on to discuss the many ways one may come to wealth or poverty, by judging the planets that either help or hinder the native’s finances. Saturn, as we might expect, has everything to do with farming, mining, treasures, real estate, usury, prisons, ancient men and farmers. We would imagine, too, profit from funeral parlors or the construction industry. Jupiter, on the other hand, brings money from “dignities ecclesiastical” and religion in general, government, and the upper classes. Too, Jupiter is associated with the law; judges, advocates and lawyers can all help or hinder the native’s wealth. Mars brings or takes money via lawsuits, warfare, quarrels, tyranny and horsemanship, while specific people bringing about increase or decrease in wealth are soldiers, lawyers and thieves. The Sun shows gain or loss from kingdoms, nobility, public office and royal favor granted by rulers, nobility, and those in authority. 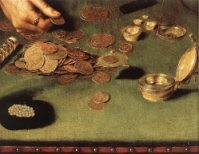 Venus brings or loses money via friends, women in general, art and music, jewels and beauty products, gambling, and the wife or mother. Mercury is all about contracts, negotiations, “all manner of subtle arts,” such as computers, divination, and the sciences. The associated helpful or harmful people are scholars, philosophers, merchants, lawyers, and “witty and ingenious tradesmen.” The Moon brings or takes money via anything wet, such as drinks or the sea, women, the common people and messengers/ambassadors. The house location of each relevant planet will show the area from which wealth or losses will accrue. Too, the strength or weakness of each planet and its interplay with financial significators will show whether the person’s wealth will grow throughout the life or whether they will suffer serious losses. 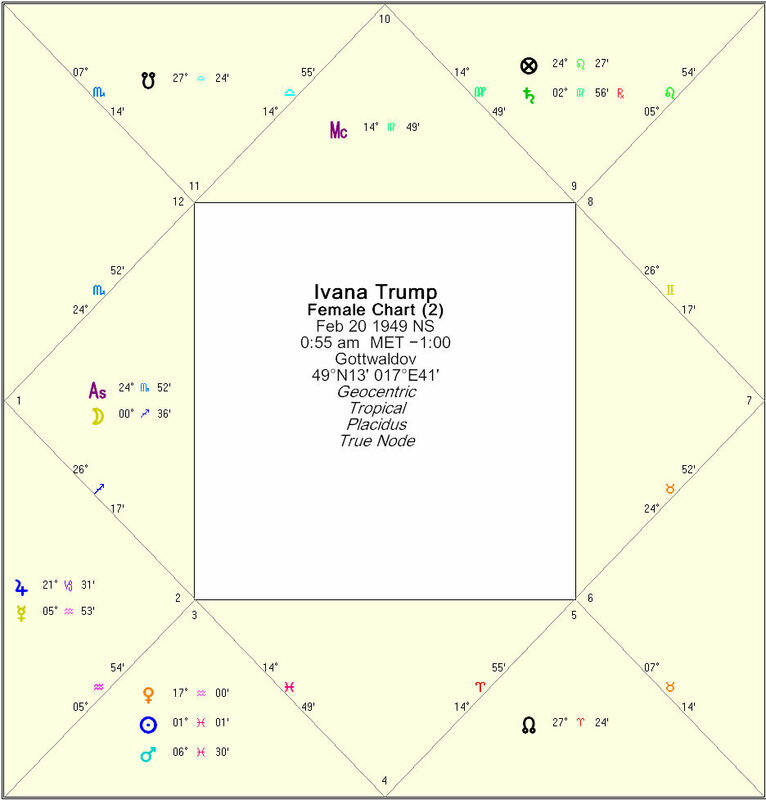 Let us examine the chart of Ivana Trump (Donald Trump’s first of several wives), an Eastern European skier and model, who divorced Trump for a settlement of approximately $14M plus annual maintenance fees. Ivana came from rather modest circumstances in Czechoslovakia, so we would expect a fairly dramatic improvement in finances in the chart. And Ivana does not disappoint in this regard. When we look at the second house, we see it is ruled by Jupiter, which is itself posited in the second house, but in its fall in Capricorn. The weakness of Jupiter here causes it to act as an accidental malefic, but in a Jovial fashion. That is, the finances will improve from the level into which she was born (Jupiter as ruler of 2nd in the 2nd) but will look far better than they really are (Jupiter in fall). Too, the fact that Jupiter is in a cardinal sign shows that money will arrive quickly, but can just as quickly leave by the back door. 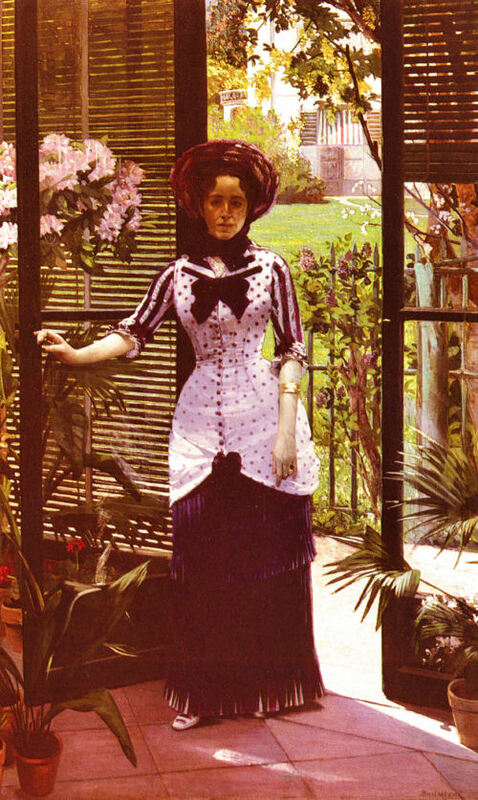 Given Ivana’s somewhat phlegmatic temperament, we can assume that any losses will be caused by the desire nature; this woman is a big spender, and is fairly changeable in her tastes, which is an expensive habit. Where will the money come from? Jupiter types, to be sure, so the rich and the upper classes. Note, however, that Jupiter is disposed by Saturn in the 9th house, which immediately makes us think of older foreigners. This is true for Ivana’s two husbands, both of whom were older and foreign. The Part of Marriage falls on 1 Pisces, conjunct the Sun, which rules the 9th house of foreigners, as well as the Part of Fortune; this is yet another indication that the marriage will involve foreigners, and will be intimately connected to Ivana’s good fortune throughout the life. The Moon, symbolizing travel, aspects the Part of Marriage from the first house, again suggesting travel associated with marriage. As you can see, Lilly’s rules hold true, though it’s the application that can be tricky, and requires a patient picking out of themes in the chart.